Tecnorib new flagship will be officially presented at the next Cannes boat show, were she will be on display with other 3 models from Pirelli's rib range. The fleet of rigid inflatable boats produced by Tecnorib continues to grow. And it does so at the top of the range, with the new Pirelli 1900, scheduled to make its official debut in September at the upcoming Cannes Yachting Festival 2017: attractive, aggressive and unmistakably PIRELLI. Together with the new boat, other models from the classic range will be on display: Pirelli 880, Pirelli 1100 and Pirelli 1400. The latter was the original inspiration for the designers that have reinterpreted the lines and style, creating the new Pirelli 1900: 18.5 meters long; 5 meters wide; 16 tonne displacement. These are the highlights of the maxi-rib that is not only set to become the shipyard’s new flagship, but also represents an important milestone in the renewed collaboration between Tecnorib and Pirelli, for which the Lombardy-based company has been licensee for over ten years now. Like the Pirelli 1400, one of Tecnorib’s great successes on the market, the 1900 is also designed by Mannerfelt Design Team, that draw inspiration from their extensive experience working on competition hulls. The biggest Pirelli ever and epitomising the brand philosophy, it is built to the highest standards of quality, starting with the resin infused hull and the 100% carbon hardtop, designed to lower the center of gravity and improve performance. In the engine room, two 800 HP MAN 16 engines with surface-piercing propellers are coupled with Top System transmissions. Pirelli 1900 has a top design speed of 45 knots, while remaining easy to handle at all times thanks to the joystick and automatic trim system, which facilitate driving at both high and low speed. 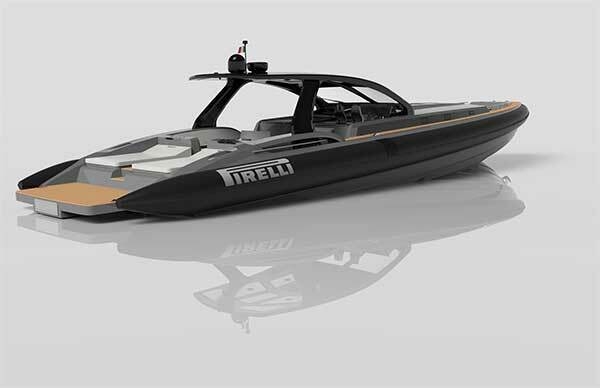 The new Pirelli 1900 matches high performance with the ultimate comfort in cruising; isn’t designed for racing, but as a regular rigid inflatable boat, with real inflatable tubes and the solidity and seaworthiness that these craft guarantee. The hull has been designed to offer high performance without compromising on comfort, and as a result it isn’t particularly narrow, which also translates into hospitable interiors with a height of up to 2 meters. Tecnorib’s new flagship reprises the lines of the Pirelli 1400, but reinterprets them from a new, innovative, perspective, recalling the signature style of its little sister, but with an even greater focus on the development of communal areas, where social life unfolds onboard. The lines unmistakably belong to a Tecnorib boat; the outstanding feature is the design of the carbon hardtop, which extends aft to protect the cockpit. Taken as a whole, the styling conveys an idea of sportiness, but also of luxury and modernity: a tribute to the history and identity of the ‘long P’ brand. The scene-stealer in the bow is the huge sun lounging area, while in the stern, the entire cockpit area can be customised according to the owner’s preferences. As always, the distinctive Pirelli tyre tread design appears on the inflatable tubes, like all the boats in the range. But this time the featured pattern is the Blue Wet tread used by Pirelli in top track races, paying tribute to the expertise gained by Pirelli designing tyres for extremely wet conditions. In contrasts with the gritty sportiness of the exteriors, below deck the interiors are characterized by an elegant, essential and almost domestic environment. Every element is in perfect harmony and equilibrium with the others. Warm materials like bleached woods are juxtaposed with metallic effect lacquers in smooth, light colours. In the cabins, elegant fabrics clad the settings with understatement and sophistication. The bathrooms use Corian™ and mosaic to conjure up a precious atmosphere. The basic layout features two big cabins, two bathrooms and the central living area, containing the galley, a dinette that can be transformed into an additional berth, and a dining table. The big owner’s cabin is in the bow, with a double bed arranged lengthwise and its own exclusive bathroom. In the stern, on the left, the guest cabin is laid out across the beam and its bathroom can also be entered from the main saloon, for use as a day toilette. Also in the stern, but on the starboard side, is a big and extremely practical technical storage compartment. In the second solution available, which is the one we’ll see debuted at the upcoming Cannes Boat Show, this latter space is replaced by a third cabin for the crew.